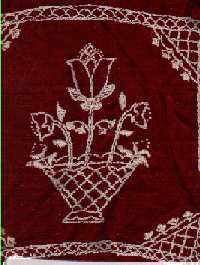 Needlework crafts add a personal touch to a home, and fabric art can be mixed with other media to make attractive wall hangings and groups, but hanging needlework crafts on a papered wall is often a challenge. Pounding a nail into wallpaper is a permanent solution that is not the best choice. We have had wallpaper, including fabric backed paper, vinyl front, and jute, and have found a suitable way to hang art on wallpaper with no permanent damage. It involves making cuts with a razor blade or sharp knife on the wallpaper. Make a V shaped cut and lift the flap up. Place your hanger under the flap in the space where the paper is lifted. If you want to move the artwork, remove the hanger and glue the flap down. You will never see the cut! We hang mostly needlework crafts at our house, but any art can be hung on a wallpapered wall without damaging the wallpaper permanently. Do it correctly, and you can move the art around to redecorate or change the arrangement as many times as you choose. See you again soon with more needlework crafts and stitching fun. Single pillowcases that are embroidered are great for crafts, and we have made several different crafts projects from old single pillow cases that are still good. Sometimes the mate is lost, or worn, or damaged, but the other pillow case is usable. A single pillowcase will make an apron, but plan ahead so the design is pleasing. Here's how. Envision how the embroidered design will look on the apron, and devise a method that will make it go in the right direction, and in the middle of the front of the apron. Here's what we did. Cut the pillow case in the middle of the back so that the apron has seams at the sides. Now, look at the embroidery and see if it needs to be turned right side up. If so, cut the pillowcase in half horizontally, and sew the plain half on the other side of the embroidery so the embroidery is near the bottom of the apron. Cut two strips about 5 inches wide to make a waistband for the apron. If the pillowcase does not have about ten inches to spare, use a color of fabric that is found in the embroidery as an accent. Stitch the sides with a narrow hem, and do the same for the bottom. Gather the top edge and sew the waistband and ties to the gathered area, right side to right side, starting at the middle. Turn the waistband over, press a narrow hem, and stitch. Then hem the ties and you have a new old apron. Recycle old pillowcases into doll clothes, appliques for clothing, or laundry bags. Have fun, but never pitch out any embroidery. There are many uses for almost all of it, and particularly pillowcases and large flat pieces. We share original patterns and ideas so you can have fun with needlework crafts and recycling. Have a great week! If you give gifts for Mother's Day, now is the time to get crafts projects done and set aside before you are too busy with dinner and whatever else you like to do for Mother's Day. 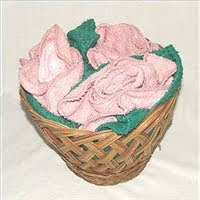 We often make a bathroom decorator basket of flowers with washcloths that is easy to do and requires no sewing. Find a basket you like that is seven or eight inches in diameter, and purchase some washcloths in a color that will match the bathroom decor. We also divide flowers and container garden plants to share for Mother's Day, and this should be done early so the flowers can get accustomed to the new pot. Wait until close to Mother's Day to put some colored foil and a ribbon around the pot, and the gift recipient will never know that this is a Do it Yourself container plant that cost you almost nothing. Be creative and make Mother's Day gifts from love and little money. The mothers in your family will appreciate that you spend time and creativity on the gifts. Whether you choose fabric flowers or real ones, start now and get the project underway. See you again soon with more needlework crafts, sewing and stitching fun. Craft buttons are getting prettier, and more intriguing for use on fabric crafts and fabric art. If you have been looking at buttons lately, you may be surprised to find figural buttons for animals, butterflies, birds, and even faces. These craft buttons are good accents for needlework crafts and fabric arts. We occasionally find some craft buttons at a thrift store, and buy any we find just to accent pillows or use on embroidery projects or wall hangings. Find some craft buttons, then find a project to use them. If you have an embroidery project, do the embroidery first, then arrange the buttons to make a pleasing display. Buy craft buttons the next time you see them at a bargain, and save them for a future fabric art project. You can find lots of uses for craft buttons on needlework crafts, but be sure to consider that some ideas are not very practical. Use on pillowcases should be restricted to an area where you do not intend to lay your head, unless you can sleep on buttons or don't mind marks on your face. The same is true for pillows you want to use. Decorative pillows are a great place for craft buttons, and wall hangings are ideal. Purses, totes and handbags are a good place for craft buttons, too. Design your own items and create your personal style with needlework crafts and the use of fancy buttons.